Operational stress is the process of responding to the challenges of Navy life, as well as the direct and indirect challenges associated with Navy operations—and Sailors aren’t the only ones who feel its effects! Frequent moves, lengthy deployments, reintegration and tough missions—coupled with the daily churn of home life—can lead to operational stress for the entire family. Some stress is good; helping us better respond to challenges, build resilience and promote family togetherness. However, exposure to prolonged or extreme stress can negatively impact health, performance and relationships. April is National Stress Awareness Month and there’s no better time for you and your family to check in with each other— and yourselves. The Operational Stress Control (OSC) program’s Stress Continuum Model can help Sailors, families and commands identify stress reactions and guide appropriate action based on four color-coded zones: Green (Ready), Yellow ( Reacting), Orange (Injured) and Red (Ill). Practice active communication and engagement to strengthen relationships. Explore resources available through your local Fleet & Family Support Center and/or Military OneSource. Practice self-care as outlined above. Set goals to get back to the Green. Severe distress that persists or worsens and leads to a loss of function characterizes the Red Zone. While only a medical or psychological health professional can diagnose a Red Zone illness, it is important to recognize what steps to take to get appropriate care. Remember, seeking help is a sign of strength. If danger is imminent, contact 911. Seek medical treatment. Ask a trusted friend or family member to accompany you. Follow the treatment plan outlined by your provider. Navy’s Operational Stress Control Program has tools and resources to help you navigate stress and build resilience during and beyond the rigors of military life. Follow OSC online for daily tips, tricks and small acts to help you and your family stay in or get back to the Green. Editor’s Note: The NPC website is currently experiencing technical difficulties. If you have problems accessing resources, please e-mail suicideprevention@navy.mil. September is Suicide Prevention Month and we have the resources you need to get actively involved in supporting your shipmates this month and throughout the year. 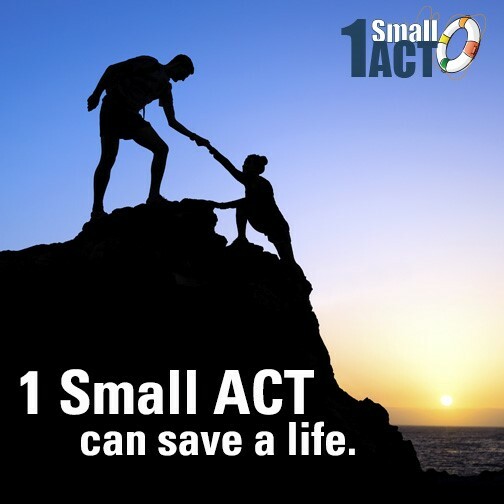 Building on the Every Sailor, Every Day campaign, the 21st Century Sailor Office’s Suicide Prevention Branch, OPNAV N171, is introducing the message “1 Small ACT” during this year’s observance. The little things that we can do as shipmates, leaders and family members every day can make a big difference in the lives of others. While suicide prevention is an ongoing effort, this month’s observance is the perfect time to catalyze engagement and encourage your shipmates to support one another through life’s challenges. You can get started today by participating in the 1 Small ACT Photo Gallery on our Navy Operational Stress Control Facebook Page (www.facebook.com/navstress) to illustrate practical applications of the 1 Small ACT message. By contributing to the photo gallery, you can demonstrate your commitment to supporting every Sailor, every day by highlighting simple ways to make a difference, inspire hope and save a life. Submissions will be accepted through Aug. 31, 2016. Send your photo to suicideprevention@navy.mil for review and posting in the photo gallery. In the email, include your command or organization and the small act written on the sign (may be used as caption). Like us on Facebook (facebook.com/navstress) to view and share your image as inspiration to your shipmates, friends and family! You can also submit your 1 Small ACT photo through the Real Warriors mobile application. The Real Warriors app is an online photo-sharing service that offers peer support for warriors, veterans and military families. Users can upload photos to the Wall, salute others and access 24/7 resources. If you don’t have the sign, just hold up your index finger in the photo, pick an inspirational message (e.g. “Real Strength”) and write your 1 Small ACT as a caption. You can download the app on the Apple App Store or view the Wall on your mobile browser at realstrength.realwarriors.net. Using the 1 Small ACT a Day calendar from the toolkit (available for download with a free Issuu account here), include examples of simple actions to promote suicide prevention in your command’s Plan of the Day or Plan of the Week notes. Educate five shipmates on five risk factors or warning signs for suicide, and asking them to pass it on. Organize a 1 Small ACT challenge. Encourage your shipmates to perform meaningful acts throughout the month of September and share each on a designated wall in a high-visibility area, using the 1 Small ACT photo gallery sign. Organize a 5K walk/run aboard your ship or installation, using 1 Small ACT as the theme. Have a 1 Small ACT photo station next to the check in table, stocked with printed photo gallery templates from the toolkit and bold markers so that participants can submit their images to the photo gallery (include instructions for submission at the table as well). Post educational content to your command, unit, installation or organization’s social media networks. You can use the sample social media messages in the toolkit or choose your own messaging. Make sure to use the #1SmallACT hashtag! Organize a showing of the “Every Sailor, Every Day” video followed by an open discussion about bystander intervention, peer support and active engagement. Be sure to follow communications guidelines described in the What’s in a Word fact sheet in the toolkit. The 1 Small ACT Toolkit, available for download here, includes materials such as printable posters, social media graphics and sample messages, talking points, a sample proclamation from the commanding officer and more. Bookmark Navy Suicide Prevention’s webpage, like us on Facebook and follow us on Twitter for more resources to support every Sailor, every day. What will your small ACT be? Editor’s note: The webinar discussed in the following news release has now been published on the NMCPHC website at http://www.med.navy.mil/sites/nmcphc/health-promotion/Pages/webinars.aspx. 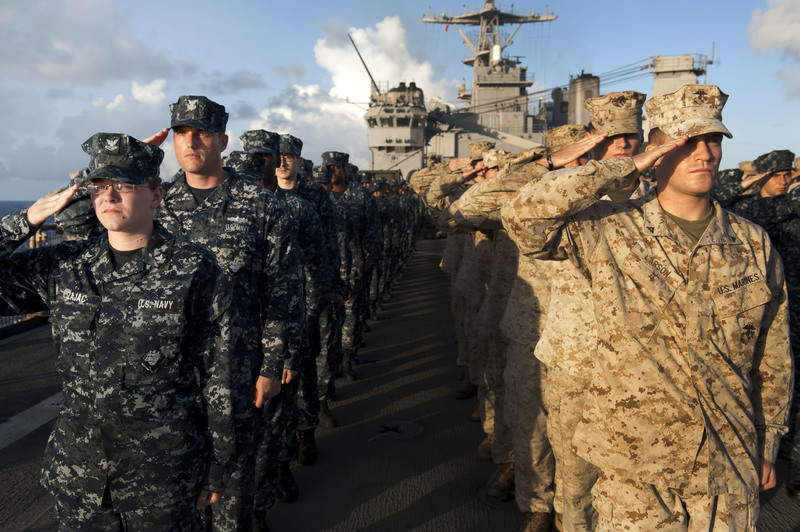 The Department of the Navy recognizes September as Suicide Prevention Month. The Every Sailor, Every Day campaign continues to emphasize the importance of ongoing support for our fellow Sailors and Marines by promoting the message “1 Small ACT.” In observance of Mental Health and Suicide Prevention Month, the Health Promotion and Wellness (HPW) Department at the Navy and Marine Corps Public Health Center (NMCPHC) will host a webinar in collaboration with Navy Suicide Prevention Branch (OPNAV N171) and Marine and Family Programs to discuss evidence-based programs and tools for suicide prevention and intervention used in the Navy and Marine Corps. This webinar will be focused on efforts from the deckplate to the leadership level. Speakers will address the importance of recognizing and understanding the factors that put Sailors and Marines at risk for suicide and the importance of communicating with one another to connect the dots and take action. NMCPHC will discuss the available resources that can assist Sailors and Marines navigate stress and develop the positive coping skills that can assist with facing life’s challenges. Navy Suicide Prevention Branch will address evidence-based intervention resources, tools, and training across the Fleet. Marine and Family Programs, Community Counseling and Prevention will present the Marine Corps INTERCEPT Program and current Marine Corps suicide prevention efforts. Describe current evidence-based suicide prevention and intervention efforts across the Navy and Marine Corps. Communicate the importance of recognizing and understanding the factors that put Sailors and Marines at risk for suicide. Identify helping resources available to Sailors, Marines, and their families across the Department of the Navy and the Department of Defense. Registration is required for this webinar, and registration will close on Aug. 27. For registration information, visit the HPW Department’s Webinars Web page. You must have a Common Access Card to register for/attend this webinar. Navy Suicide Prevention Branch’s annual Cross Disciplinary Case Reviews consistently find that the majority of Sailors who die by suicide experienced a loss of belongingness, such as an inability to connect with shipmates, feeling like a burden on friends or family, or a perceived lack of purpose in the workplace or mission. While suicide is rarely the result of a single stressor or risk factor, strong connections and support are protective factors during challenging times. One small act from a shipmate, leader or family member can make a difference, and save a life. September is Navy Suicide Prevention Month, kicking off our upcoming fiscal year Suicide Prevention efforts across the fleet. This year we are launching a new message within our Every Sailor, Every Day campaign, 1 Small ACT. This message encourages simple yet meaningful interactions to support one another, foster dialogue, promote early use of resources and prevent suicide. Our goal isn’t to prevent suicide on a single day or month—and we need your help to be there for every Sailor, every day. By leveraging Suicide Prevention Month in September, shipmates, leaders, family and community members can reenergize local efforts and build sustainable initiatives that motivate positive action all year long. To help you kick off this phase of the Every Sailor, Every Day campaign at the deckplate or in your community, Navy Suicide Prevention Branch has developed the 1 Small ACT Toolkit to implement in September. This printable toolkit includes resources to help in times of crisis, high-resolution graphics for use on social media or in print products, and ideas for actions you can take during September and year-round. This year, Sailors, families and the entire Navy community will have the opportunity to engage and contribute at the peer level by participating in the 1 Small ACT Photo Gallery. 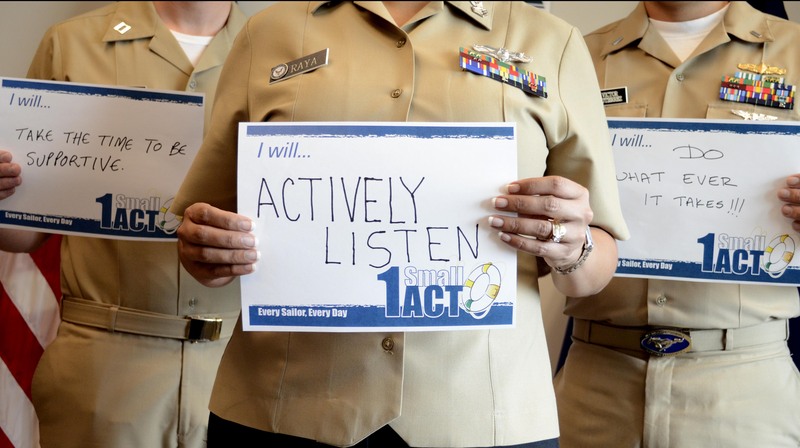 Individuals or groups can post photos of themselves holding up the 1 Small ACT sign personalized with a simple action that they can perform to make a difference in a shipmate’s life (e.g., “I will continue to reach out to my shipmates, even after they’ve changed duty stations.”). The image gallery will be housed on the Navy Operational Stress Control Facebook Page, illustrating the many ways to support every Sailor, every day. Submissions will be accepted from Sept.1, 2015 through Aug. 31, 2016 by emailing photo(s) to suicideprevention@navy.mil or uploading via the Real Warriors App. Be sure to check out the entry details in the toolkit or online before submitting! On Sept. 1, suicide prevention coordinators, health promotion personnel, chaplains, leaders and other key influencers will have an opportunity to learn more about Navy’s evidence-based suicide prevention and intervention tools through a live-facilitated webinar. More information about this training, co-hosted by Navy Suicide Prevention Branch (OPNAV N171) and Navy & Marine Corps Public Health Center (NMCPHC) is available on the Webinars page of NMCPHC’s Health Promotion and Wellness Department’s website. Registration is required by August 27 and can be completed by visiting https://survey.max.gov/933674. One small act can make a big difference. Let us know how we can help you plan and organize your efforts to fight suicide, in September and throughout the year! To get the latest Navy Suicide Prevention Month resources, including the 1 Small ACT Toolkit, visit our Every Sailor, Every Day webpage. Follow us on Facebook and Twitter for examples of small acts that you can perform on a daily basis to support your shipmates, and stay tuned to NavyNavStress for more resources.